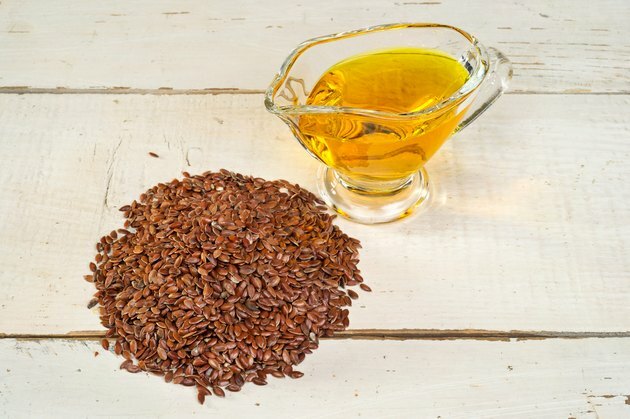 What Are the Benefits of Taking Flaxseed Oil at Bedtime? Available in a liquid or soft capsule, flaxseed oil is heralded for its many healing properties by the University of Maryland Medical Center website. Flaxseed oil, sometimes known as linseed oil, has three beneficial components including protein, fatty acids and fiber. Proponents of flaxseed oil believe each component is responsible for a specific type of healing. The benefits of taking flaxseed oil at bedtime are multifold; however, users should be aware that as a supplement flaxseed oil is not guaranteed to cure or treat any diseases. For athletes or those who body sculpt, flaxseed oil taken at bedtime has musculoskeletal benefits, according to the Bnet Health Publications website. Combined with a protein shake, flaxseed oil has been shown to prolong the digestion and breakdown of the proteins. This elongation of breakdown allows the protein by-products, like muscle-building amino acids, to remain in the system throughout the night. The fatty acids, omega-3 and omega-6, are the cardiovascular protective components of flaxseed oil. The potential for flaxseed oil to prevent heart attack, stroke and high blood pressure is under debate. Healthvitaminsguide.com states that flaxseed can assist in regulation of the heart beat, good for those with arrhythmias, or heartbeat disorders. Taken at bedtime, flaxseed oil circulates in the system during rest. The omega-3 fatty acids in flaxseed oil may help reduce inflammation throughout the body. Inflammatory diseases, such as arthritis, lupus and inflammatory bowel diseases may gain relief with regular use of flaxseed oil. A 2002 article in the "Journal of the American College of Nutrition" states that although omega-3 fatty acids are more concentrated in fish oils, they are present in flaxseed and can also be used to relieve ulcerative colitis and auto-immune disorders that cause inflammation throughout the body. The fiber component of flaxseeds transmits its healing properties to the expressed oil supplements. This fiber can cleanse the colon and regulate bowel movements, potentially eliminating constipation. According to Healthvitaminsguide.com, flaxseed oil is beneficial in those suffering diverticulitis, a painful inflammation of the colon. Taken at bedtime, flaxseed oil can work in the bowels overnight producing a gentle, natural morning bowel movement. Is it Safe to Take Flaxseed Oil With Other Medications?